I’ll be in Nottingham next week giving a lecture as part of the intriguingly named Horizon Scanning Lecture Series, for MA/MSc Smart Design & MA Product Futures Lecture series at Nottingham Trent University. This is the blurb: Hazel White develops products and services to demonstrate how we can usefully embed technology in our lives. In 2012 she was supported by the Scottish Funding Council to develop KISTproject with the Children’s Hospice Association Scotland (CHAS) and children with life-shortening conditions, their families and carers to develop systems using bespoke, playful objects to enable independent access to online communication. In 2009-10 she developed Hamefarers’ Kist, a networked interactive device to enable older people, health and care professionals re-imagine products and services for older people. It has been exhibited and disseminated through public and professional health seminars and is the subject of a case study in a forthcoming book from the Center for Assistive Technologies and Environmental Access (CATEA) at Georgia Institute of Technology. In 2009 she led research to develop tools for Deutsche Telekom, Berlin to engage multi-disciplinary teams in the development of information and communication products and systems for older people. In 2007 she won an AHRC grant for a project which used jewellery artefacts to gain insights from a range of users into new uses for wearable technology. 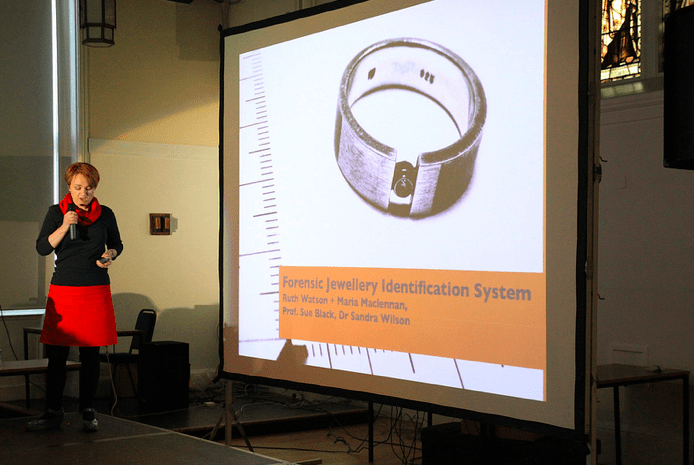 Hazel’s research and practice is moving into Design for Services – her students have been working on forensic jewellery identification systems, re-use of tents at music festivals and digital accessories to comfort those going into care. In the last 12 months Hazel and her students and graduates have facilitated workshops with representatives from the Scottish Government, all 14 Scottish NHS Boards, the Police, the Crown Prosecution Service and Social Services using design methods to elicit insights and future visions. She was recently a keynote speaker at the launch of the Global Service Design Network in the UK. Hazel is Director of the Master of Design for Services Programme at the University of Dundee. Quick notes on the BBC R&D unconference event in early November. The purpose of the event was: to share ideas and capture thoughts about ‘playful’ IoT futures to advance IoT thinking in new domains like media, entertainment, storytelling, games and toys. The invite was extended to leaders and disruptors in this area, from makers, researchers, and academics to toy and game designers, artists and writers. four fun ways to play in Monster, Dress-up, Super Moshi or DJ Mode. Poke your monster in the eye, dress him, even listen to music through him! The toy becomes part of a services connecting the hardware ‘toy’ with updatable content. The conversation continued onto Toy talk – an Internet enabled toy by a couple of people who have left Pixar – to be released next year. University of Nottingham on aestheticodes. These are a kind of QR code, which follows simple computational rules, enabling patterns and illustrations to to be computer readable markers. Steve talked about how it had been used by London restaurant Busaba on placemats and other items to create an experience both whilst in dining in the restaurant and afterwards (recipe downloads etc.). This may potentially have some application for our KISTproject with the Children’s Hospice Association Scotland (CHAS), enabling children, their families and carers to create their own codes on objects to link to the stories of their lives. Each year in the UK around 260 children die or are seriously harmed and £5 million is spent “learning the lessons”. The same “lessons” have been emerging since the first UK child death inquiry in 1945 without noticeable impact on child fatalities. Child Death Review (CDR) processes in the UK have evolved almost exclusively from social work. The Scottish Universities Insight Institute are hosting a knowledge transfer event headed by Alyson Leslie, Linda Walker and Professor Sue Black from the University of Dundee. The aim is to think about child death review processes differently, bringing together expertise from the fields of forensic investigation, psychology, education, design, statistics, policing, law, social work and health. Next week I’ll be responsible for design facilitation at the first of four CDR events over the coming months at the Lighthouse in Glasgow. Recent Master of Design graduates Sara Nevay and Angela Tulloch will be working with me to enable participants to use design techniques to quickly understand the roles of the forty national and international co-participants, mapping their relationship to the child at the centre of the Child Death Review and exploring the information that they collect pertaining to the life and death of a child. Recently I’ve been working with NHS Scotland and the Scottish Government and colleagues and students from the Master of Design Programme at the University of Dundee to re-imagine outpatient services. In the year ending March 2011 there were 4,558,000 visits to outpatients in Scotland. This is the equivalent of almost every person in Scotland being seen in outpatients once a year. To create a service which meets the expectations of users, providers and commissioners, some radical re-thinking is necessary. In 2012 the Scottish Governments’ Government’s Quality & Efficiency Support Team (QuEST) and NHS Scotland brought together consultants, GPs patient representatives and service managers from Scotland’s 14 health boards in two half-day workshops with the objective of a radical re-think of outpatient services. I was invited to facilitate the two innovation sessions to develop principles for the 2020 vision of Outpatient Services as outlined by the NHS Primary Care, Community and Outpatients Quality and Efficiency Support Team. A range of design methods were used, including RIP + MIX, speed networking, patient personas and backcasting to enable participants to think creatively about the future. My key takeaways were that the people that we want to take the flak when things go wrong are the people who have the best ideas about how we can be enabled to move beyond a patriarchal system to a place where we can understand and manage our own health. We need to listen to them. A paper I’m preparing for the Faculty of Pubic Health conference discusses the results of the two workshops, both in terms of the efficacy of the methods which led to rapid sharing of leading-edge practice and the development of themes focussing on empowerment, flexibility and the creative use of technology and draws conclusions on the role and value of design as part of an innovation process in healthcare. Thanks to Gillian and Lyall at Creative Dundee for organising and doing such a great job of bringing Pecha Kucha to Dundee and making it one of the best reasons to get a babysitter. You can see my talk here about our new Design for Services course.